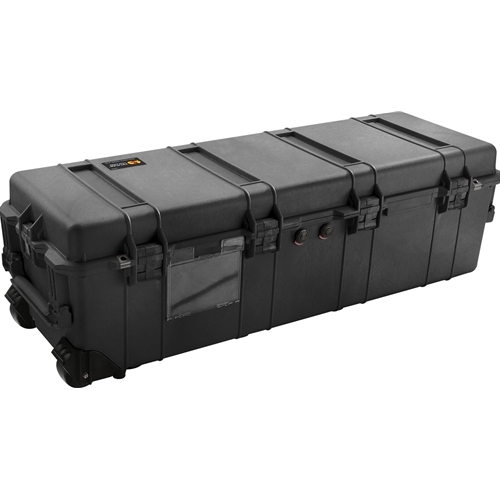 The Pelican™ 1740 Case offers many useful features, including four extra-deep base-to-lid locking cleats that ensure maximum stacking stability, two Integrated Automatic Pressure Equalization Valves and an O-ring seal, two rugged double-wide handles, wide-track polyurethane wheels with ball bearings and nylon hubs, open cell core, polymer wall construction, stainless steel hardware and padlock protectors, and easy open Double Throw latches. Some optional features are a 6-piece foam set and a personalized nameplate. The Pelican™ 1740 Case is watertight, crushproof,and dustproof, and Pelican™ backs this case with a Lifetime Guarantee of Excellence.